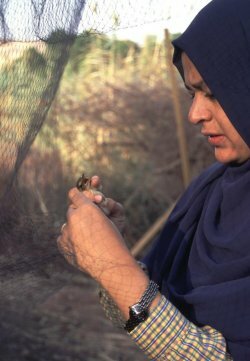 Mist nets are the most common catching device used at bird ringing stations. They can differ in thread (material used and/or thread thickness), mesh size, dimensions (number of shelves, length), tethering. 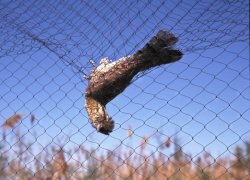 Generally thicker nets are recommended at the stations with heavy migration of Passerine birds. They are more safe to migrants - birds are not entangled (Fig. 1) and are easier to remove (Fig. 2), though thicker thread in turn means lower catching ability of the net. The mesh sizes used depend on the species for which the effective use of the net is intended. For small passerines the mesh size most in use is 16 or 17mm. Standard nets usually have four shelves and it is advisable to use only two lengths of nets – short net (6-7 or 9 m) and a doubled one (12-14 or 18m resp. ).